Find hotel near National Wine Centre Of A ..
A top tourist attraction, the National Wine Centre of Australia is an ideal place for wine connoisseurs and novices alike. Opened in 2001, it takes visitors through an experiential journey on winemaking and appreciation. A great place to sample and learn more about Australia’s finest wines, one can enjoy a wine tasting and food pairing experience here. The Centre’s interactive Wine Discovery Journey and Exhibition is an ideal way to understand the wines of Australia more intimately. There are over 120 wines available for tasting and purchase at the WINED Bar and one can head for a meal to the Cellar Door restaurant located on the ground floor. Outside the building one will find rows of grapevines that showcase seven different vines from the region. Explore the building outdoors and terrace area for some stunning views of the Botanic garden nearby. If visiting in winter you may need a warm coat even indoors. Try some of the excellent cheeses available to pair with your wine. You can walk to the wine center from the Botanic Gardens and enter through the pedestrian entrance on Botanic Road. Bus: Botanic Road (Stop 1) or Hackney Road (Stop 2). How popular is National Wine Centre Of Australia? People normally club together Mt. 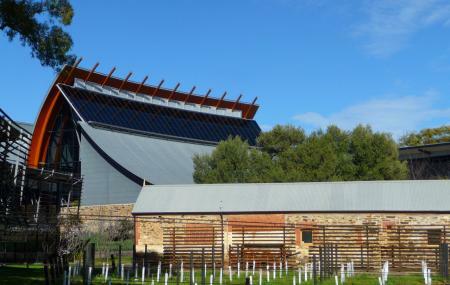 Lofty Summit and Ayers House Museum while planning their visit to National Wine Centre Of Australia.